What do all the Multiport valve settings actually do? This article explains what all the settings on the Multiport valve system on your pool sand filter actually do. What is a Multiport valve? If your swimming pool has either a sand filter or a D.E. (Diatomaceous Earth.) filter then it will almost certainly have a Multiport valve. It will be positioned either on the top or sometimes on the side of the filter tank and have a locking lever that can be turned to any one of 6 positions. The positions might just be numbered but usually they are marked with a single word. 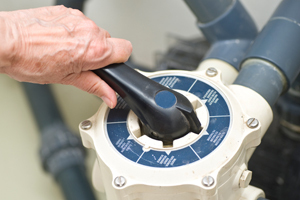 By changing the position of the lever on the valve you can route the water from the pump around or through your filter in different ways so that you can perform different maintenance operations on your pool water. So what do all those settings mean? The lever should be on the ‘Filter’ setting most of the time. This is the setting that provides normal pool filtration by pushing the water through the filter media (sand, glass beads or D.E) that then traps any dirt and debris before the water is returned to the pool. This is the setting that you would use when you are vacuuming your pool as well. When the Multiport valve is set to ‘Backwash’ the flow of water through the filter is reversed so that all the dirt and debris that the filter has cleared from your pool water and has accumulated in the filter medium is then flushed out and sent to waste. You should backwash your filter for about 2-3minutes or until the waste water runs clean. This can usually be seen in the clear plastic sight glass on the Multiport valve. The ‘Rinse’ setting should be used after backwashing and again run just for a minute or two. On this setting the water is flowing through the filter in the normal direction but once again is being sent to the waste pipe rather than being returned to the pool. This setting does pretty much what it says and rinses out any last traces of dirt and debris from your filter after the backwashing process. These three settings are the ones that you will use most of the time on your pool filter; filter, backwash and rinse. But there are three other Multiport settings, so what do they do? This setting draws water from the pool and sends it straight to the waste outlet without passing through the filter. You would use the ‘Waste’ setting to drain or partially drain your pool or you may use it when vacuuming if there is a lot of dirt and debris on the bottom of your pool. Never drain a pool without first seeking advice from a pool professional. This setting is only used when servicing the pool pump. Never run the pump with the valve in the ‘Closed’ position. In the ‘Recirculate’ position, the filter is bypassed. Water is drawn in from the pump and then returned straight to the pool. In some instances, if you are adding pool chemicals, then it can be used to make sure that the chemicals are thoroughly dissolved through the pool water without going through the filter. An efficient alternative to traditional filters. Waterco Micron Bobbin Wound Filters are an innovative and efficient alternative to the traditional pool filter. The filter features a fishtail configuration that offers superior filtration by eliminating the dead areas commonly associated with a traditional star design. This highly efficient design reduces the amount of water used during backwashing by up to 30%. The filters can be specified for a new build or installed when you are refurbishing your pool. Waterco Micron Bobbin Wound Filters are manufactured from the highest grade of non-corrosive materials and are designed and built for many years of trouble free operation. The filter tank has a 10 year warranty on residential installations. We hope this article has been of use to you. If you would like help in finding a pool professional or pool service engineer in your area then please use the contact button at the top of this article.